A stop over during your cruise in the Mediterrean? Or a vacation spent between the beauties of Rome (St. Peter’s Square is only 40 mins. away), the nearby beaches, and the Etruscan necropolises of Tarquinia and Cerveteri, or other surrounding locations (Viterbo, the medieval town of Popes, the dying town of Civita, Orvieto, Ostia Antica, Tivoli)? In Civitavecchia you’re in the right place! 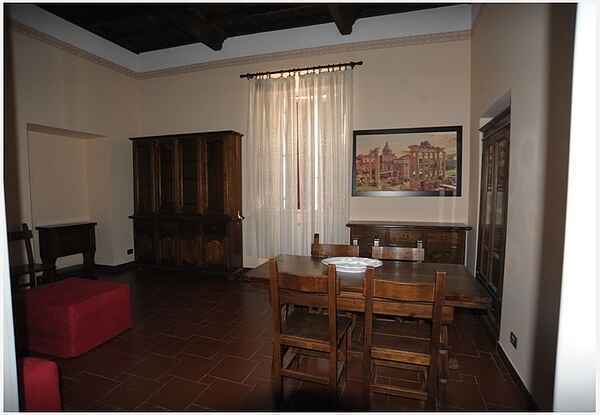 Our apartment is located in the very heart of the town, in one of its most ancient buildings, just off the harbour, between Michelangelo’s fortress and the cathedral. The apartment features mighty great walls, four-meter-high wooden-beamed ceilings, and all-over ‘cotto toscano’ flooring; this historic flair is combined with modern comfort. You will enjoy an enchanting view on the harbour ‘Arsenale’ enveloped in a peaceful quiet, yet be met with the liveliness of the town as you exit the building and find yourself right in the downtown area brimming with people and activities. Open air bars on the promenade where you can relax with a cappuccino or enjoy a gelato in the warm evenings, great restaurants, wonderful pizza places, the best shops under the colonnade, the fishing harbour where one can buy fish directly from the fishers, the market, and the railway station: everything is at your door-step! You can get there by foot in less than 1 minute! The bedrooms can accommodate up to 6 people and make the apartment ideal for families, couples, or also for a small group of friends, who want to share costs, given the double sofa-beds in the living room and in the large entrance hall. The apartment features a large living room with a panoramic view on the harbour, a fully equipped kitchen, two bedrooms, two full bathrooms, air conditioning and central heating, TV, WI-FI in every room, and access by elevator. We also supply our guests with an Italian mobile telephone, which you will find very useful in several occasions. We are glad to help our guests with any additional information both practical and cultural, in many languages, so do not hesitate to ask. - the Etruscan necropoles of Norther Latium (Cerveteri, Tarquinia, both Unesco Heritage, Vulci, Roselle etc.